100 years ago, under the auspices of the ICRC and the Swiss Confederation, the French and German governments signed the Bern Agreements. A result of long and arduous negotiations, these agreements were the culmination of humanitarian attempts that favoured humane treatment of prisoners of wars and their repatriation. One century after their signature, it is time to recall and learn from this humanitarian achievement. Between seven and nine million soldiers were interned during the First World War. Held in thousands of camps, these prisoners of war (PoWs) experienced a range of internment conditions. A majority were forced laborers, working at times in harsh environments. Due to food and medical supply shortages, thousands died. Some of the prisoners were mistreated, tied to upright posts or beaten. The length of the conflict and the distance from their families also had a huge impact on the prisoners’ general physical and mental health. Their material well-being depended on many factors, including the place of detention, the climate, the presence of humanitarian aid and the attitude of the detaining authorities. Yet, harsh conditions of internment were not caused solely by economic, material or logistical difficulties. The conditions also resulted from a deliberate policy by belligerents of using reprisals against the PoWs. Notwithstanding this huge number of internees, in 1914, the international legal framework governing PoWs was far less developed than today. The 1906 Geneva Convention and the 1907 Hague Conventions had few provisions providing protection for PoWs. The first complete Geneva Convention relative to the Treatment of Prisoners of War was not signed until 1929 (and even then never actually entered into force). As a way of dealing with this gap in treaty law, the ICRC and Red Cross National Societies engaged in multiple assistance operations, as well as diplomatic ad hoc initiatives. Of these, the Bern Agreements were perhaps the most ambitious. This contribution aims to recall this almost forgotten story and to show that even in a very polarized and ideological conflict, achievements in the humanitarian sphere can be reached. British historian Heather Jones, among others, highlighted the variations in PoW treatment. Soon after the outbreak of the conflict and the first wave of prisoners, most of the belligerents accused one another of mistreating internees. In response to the initial allegations, each side resorted to reprisal measures against prisoners in their custody. PoWs faced mistreatment, were used in labor camps with dangerous working conditions, were sent in inhospitable places or close to the frontline. The resulting cycle of violence demonstrates how the countries at war used reprisals as a way to mobilize their own population by dehumanizing the enemy. In addition to the reprisals, propaganda depicting PoWs as barbarous also contributed to worsening treatment. Over time, propaganda escalated, and representations of prisoners became increasingly brutal. The propaganda shaped public opinion and legitimized violence against prisoners. The belligerents dehumanized prisoners and thus justified harsh treatment and what historians call a brutalization of their interment conditions. The mistreatment was not the same everywhere. For example, violence against PoWs was less acceptable in Great Britain than in France or Germany. Moreover, the way in which PoWs were treated varied at different periods during the conflict. This cycle of violence interacted with a ‘totalization process’ of the war—in which the radicalization of the fighting on the battlefield was concomitant with an increasingly mobilization of the economy, propaganda and civil society efforts to win the war. In 1916, reprisals became harsher. German authorities forced internees to work in hard labor camps close to the front. The Germans deliberately transferred internees in areas where they were at risk of being shelled by their own country. The Germans used this tactic in an attempt to protect their own prisoners held by the French, also in appalling conditions. Their tactic worked to a certain extent. However, this strategy also negatively affected Germany by damaging its reputation abroad, especially in neutral countries. It also had the effect of discouraging enemy troops from surrendering. On 12 July 1916, the ICRC issued an appeal to the belligerents and condemned the use of reprisals against PoWs. The German reprisals were at their peak during Spring 1917. This phenomenon illustrates the ‘totalizing logic’ that occurred during the First World War. The fight not only took place on the battlefields, but also extended to places of internment, although with different methods. At that time, internment numbers reached an unprecedented scale and internees were like pawns on a chess game. The fate of prisoners of war during the Great War is one of the many examples showing the worst aspect of humanity. In parallel with these cycles of reprisals, thousands of humanitarian actors started to bring material and spiritual relief to the PoWs. Of them, the ICRC was one of the most prominent. ICRC delegates visited more than 500 camps and produced reports that were then published in order to reassure general public opinion and the families of PoWs. Its International Agency for Prisoners of War produced millions of records providing information about the fate of PoWs. Of the many activities carried out by the ICRC, we will focus here on humanitarian diplomacy and the ICRC’s multilateral relations with States in favor of the victims. Already in November 1914, the ICRC president, Gustave Ador had asked the Swiss government to set up a system of repatriation for severely injured PoWs. 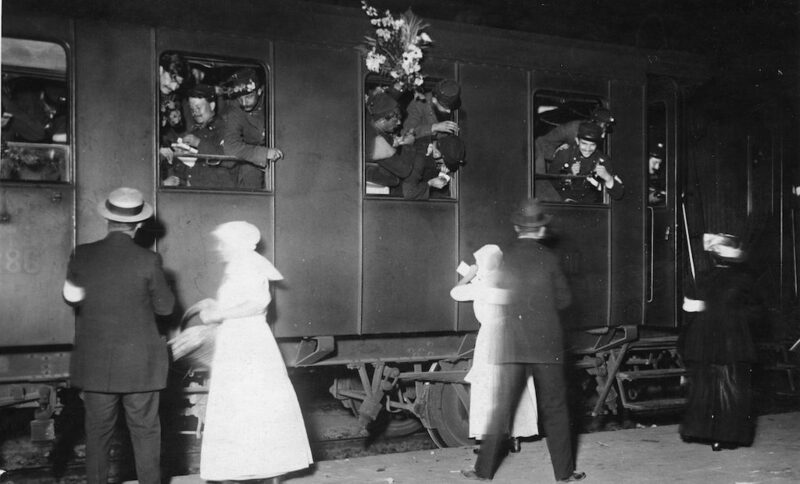 France and Germany quickly accepted, and the first repatriation trains came through Switzerland in March 1915. This initial success was, however, limited to those prisoners with specific diseases or injuries. The ICRC and Switzerland tried to expand these categories to tuberculosis and other chronic diseases. Yet, belligerents were very reluctant to do so. As a result, at that time, only few thousands of PoWs were actually repatriated. This initial success encouraged the ICRC to promote new initiatives. In parallel with similar propositions from the Vatican, Ador convinced the Swiss Federal Council to welcome sick PoWs onto its territory. After months of negotiations with the belligerents, the first internees arrived on 26 January 1916. In sum, more than 67’000 soldiers benefited from internment in Switzerland, while other similar initiatives inspired by the Swiss experience took place in Holland, Denmark, Sweden and Norway. The length of the conflict increasingly had a negative effect on the PoWs, including on their mental health. More audacious proposals came out. Again, the ICRC and the Swiss jointly proposed to extend the categories of repatriated soldiers to include the fathers of big families who had been interned for over two years. Belligerents were henceforth ready to engage in a deeper dialogue. Under the auspices of both the ICRC and the Confederation, negotiations between Germany and France around PoWs began in May 1917. In the beginning, representatives from the Allied countries and the Central Powers were reluctant to talk to one another. Swiss emissaries had to transmit the proposals between rooms before everyone would agree to meet in the same room. Marguerite Cramer, an important figure of the ICRC history, was one of the emissaries representing both the ICRC and the Swiss government. Finally, after more than six months of strenuous negotiations, a solution was reached, resulting in the Bern Agreements of March and April 1918. These agreements dramatically expanded the categories of PoWs who could be repatriated to prisoners older than 45, and those older than 40 with more than three children and those who had been in captivity for over 18 months. The Agreements potentially could have benefited 100’000 French and 100’000 German prisoners. However, because the conflict ended a few months later and led to the repatriation of all the prisoners, the PoWs who actually benefited from these specific Agreements was less. This example of the Bern Agreements is iconic but not unique. According to the ICRC records, 23 international conferences were organized during the First World War, most in 1917–1918. Half of them took place in Switzerland. These records provide testimony to the will of those involved to alleviate the suffering of PoWs. In December 1917, in gratitude for its work on behalf of these prisoners, the ICRC was awarded by its first Nobel Peace Prize. Although the First World War ended 100 years ago and as such might seem old, distant or irrelevant, the humanitarian challenges of that time are still present today in 2018. For this reason, we can draw lessons from that conflict. Often realities on the ground are what trigger changes and improvements in IHL. However, even if legal solutions have not caught up with the humanitarian challenges, humanitarian aims can still be achieved. The discussion above exemplifies another way of facing the humanitarian challenges. The ICRC, thanks to its right of initiative, has often demonstrated that it is possible to reach humanitarian agreements, beyond treaty law. The Bern Agreements are an excellent illustration of this capacity. As the world was experiencing the first truly global conflict, an industrial and disembodied war, the worst sometimes faced the best. Emerging from the horrors of war, innovative humanitarian initiatives had a real positive impact on millions of people, including prisoners. Yet, these successes resulted from a long process. At the onset, belligerents did not imagine that the conflict would last for more than four years. Although the reality on the ground quickly indicated that the war would be long and destructive, most of the countries were still convinced they would win. The vicious cycle of violence discussed above, however, did not lead anywhere. Belligerents finally decided to sit at the negotiation table once the duration and consequences of the conflict had become too great. Talks were difficult but successful. One should learn from this experience and keep in mind that the longer we wait, the higher the costs of war. Sadly, blindness to the human costs of war seems to be a constant of warfare. Belligerents are still often reluctant to engage in a dialogue with the enemy on humanitarian issues. If, in 1914, the belligerents did not anticipate the actual impact of modern warfare, today there are no more excuses. Therefore, how can we use the examples from the past showing that dehumanizing the enemy and hindering humanitarian work lead to nothing? How can we remember that, to the contrary, respecting IHL and engaging in concrete actions have positive effects for everyone? Last but not least, the First World War shows us that even in an extremely violent, polarized and dehumanizing conflict, it is possible to make enemies sign and enforce humanitarian agreements. Humanitarian organizations and neutral States have an important role to play. Note sur le rapatriement des prisonniers militaires & civils ayant subi une longue captivité rédigée par la Direction des services de renseignements sur les militaires appartenant aux armées de l’Entente, février 1918, ACICR C G1 A 42-01. Very moved by this article. French, married to an Austrian, studied partly in Germany. Would have been much more complicated 100 years ago…. No one is a winner in this war. Stories on prisoners are still shared in our families and it always strikes me how the Red Cross is well perceived generations after generations. We keep the letters. Whether it is the announcement that someone has died in a camp or whether it is help to find the location of a prisoner. Someone really cares. Thank you ICRC. Thank you for this article. Will share it with my children. One must no forget and learn from the past!